Elizabeth Smither is a prize-winning poet and author of five short story collections and five novels. 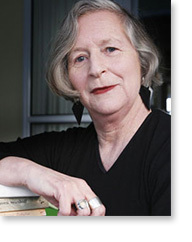 The Lark Quartet (Auckland University Press, 1999) won the Montana New Zealand Book Award for Poetry in 2000, and she was the first woman Te Mata Estate Poet Laureate (2001-2003). She was awarded the Prime Minister’s Award for Literary Achievement in Poetry in 2008. Her latest novel is Lola (Penguin, 2010). She lives in New Plymouth.